Dr. Blessing Nwagba, is the governorship candidate of Social Democratic Party (SDP) in Abia State. Her political career dates back to 1998, when she voluntarily retired from the Civil Service and veered into politics. She contested her first election into the House of Assembly that year, but the process was truncated by the death of the late General Sani Abacha, then Head of state. Since after that experience, she has remained in politics. She is a serving member of the state assembly, elected on the platform of the Peoples Democratic Party (PDP). But she is running for the governorship on the platform of SDP. 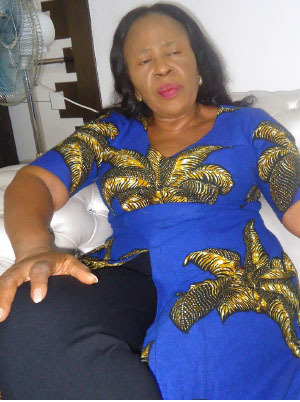 She speaks on her chances in the governorship election. Why did you leave the party that took you to the House to contest on the platform of SDP? I did so because I am a woman that is interested in the development of her society, interested in the affairs of lifting and encouraging other women to contribute their quota to the development of their society. Though I won my ticket into the House of Assembly on the platform of PDP before joining SDP, as an experienced politician, I believe that I can contribute positively to the growth of my society. PDP is just a platform to add value to governance, so if one is desirous of contributing her quota to governance she will always want to find a way of doing that. I did the beat. I did in PDP and I know that PDP is not the only platform through which one can add that value. It is that my inner desire to contribute to the development of my people, to see that the things I see that are wrong is corrected that drove me to go to another political party to enable me fulfil that desire to bring federal presence to my people in the state. And I found SDP as a credible alternative that will enable me to do that. That was the reason why I left, no hard feelings at all. There were insinuations that you left, having been offended because the party denied you ticket to go to House of Representatives, how true is that? That is no longer an issue, naturally, if one contest an election and it did not go the way he or she wants, she might be angry but that is not the reason I am doing what I am doing. I am doing what I am doing because I need to improve the lot of my people. As I speak with you, I am not angry with PDP because I have done the bit I need to do from there and I know that where I am now is a very good platform to do much better. Why do you want to govern Abia? Abia State is just like any other state and I think nothing is impossible when the right leadership is in place. The Bible tells us that when the righteous is on the throne, the people rejoice. I want to govern Abia because I believe that Abia is governable, people can be made to rejoice, those things all of us have seen as wrong can be turned around with the right leadership. The things that are wrong with Abia, such as lack of payment of salaries of workers as at when due, absence of happiness on the part of workers due to bad working conditions, if they corrected, the people will be happy. These and more are things that can be fixed. Governance is about making the populace happy, and if it is that, I know that it can be changed so I decided to come into the field to change them. Why would one not do what she can to see that payments are made and made as at when due? And why would one not want to make payment as at when due, if not could it be due to lack of fund, and one would ask , why would a government not have money? If it is from the fact that revenues are not generated enough or due to maladministration, misuse or mismanagement of funds, one can fix it. Abia is an industrious state because people here work very hard, so government should be able to generate enough revenue to pay workersâ€™ salaries and other necessities of government. So I believe that we can do better than what we are doing now. With the funds t coming in from various sources, the challenges of government would be handled and Abians would be happy. Payment of salaries and pensions are not the only challenges in Abia State, there are issues of infrastructure challenges, youths, women etc, how would you tackle all these as a governor? My brother, I would not join anybody to agree that nothing has been done in Aba for instance, a bit has been done here, but I believe that we can do better if we get our revenue sources strengthened out , then get fund from Federal allocation, companies and other sources, and there is a government that is interested in delivering dividends of democracy, that would ensure that funds are put into their rightful usage, the issue of roads, salary, infrastructure decay would be solved very easily. On the area of electricity generation, it is true that some people have been given electricity in Araria international market, but that is not enough. That is why I have come out through SDP platform to govern Abia. The way I have developed my blue print, Abia will be a place that people will be happy to identify with. We have said that we will pay salaries on 26th of every month and we shall pay Pensioners, do our best to get power, primary healthcare system will be made functional since it is the health care system that is close to the people because if it is in order, there will be less people going to the secondary healthcare facility. With that, illnesses and diseases would be reduced to the barest minimum. Women and youths form a strong force in any society, how would you handle the challenges of women and youths? Talking about women empowerment, I am the only woman in the legislative house for now, and we would be glad to have more women in elective positions, appointive positions etc, so we intend to mobilise more women to realise their potentials and sensitise them to acquire power in government because when you empower the women, you have empowered a whole nation. I am using this opportunity to call on women to prepare themselves for empowerment from our government. I am not saying that I should be elected because I am a woman, no, I should be elected because I am a qualified woman. I am a woman that feels the pulses of all others, a woman that is going to speak for them like every other person. We are going to ensure that women are mobilised to play their roles in government. As the only female lawmaker, I have never lacked in my roles as a parliamentarian.